More likely to be heard than seen! 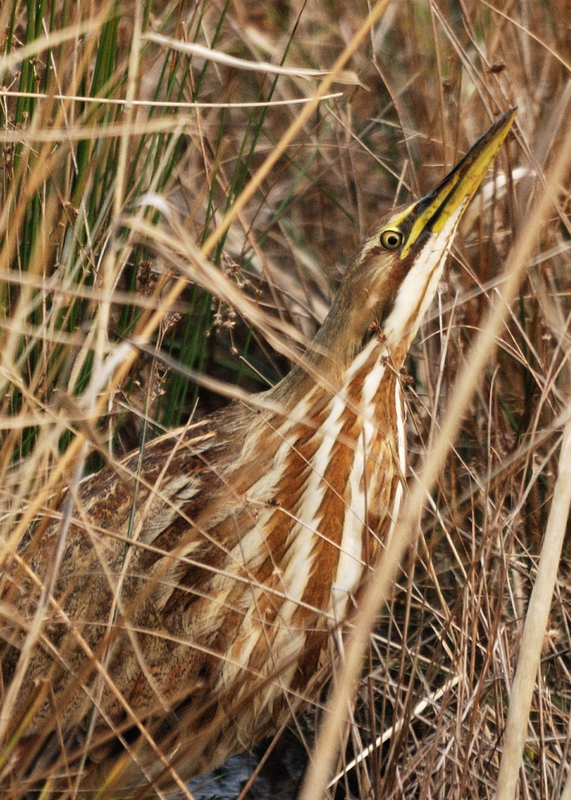 The American Bittern, a member of the heron tribe, spends much of its time in the dense cover of the marsh. Although they are found across the country, you'll seldom see one. Bitterns are masters of camouflage. Their striped plumage perfectly imitates surrounding vegetation, and they conceal themselves by freezing - holding their heads and necks upward at an angle that mimics the reeds. Have you seen an unusual bird or observed a bird doing something usual? Tell us your story! Write to us at info@birdnote.org. Support for BirdNote comes from Audubon Park Wild Bird Food, welcoming the return of songbirds with full feeders. Spring bird-feeding tips at audubonpark.com. One fine spring morning as you walk near a marsh, you are stopped in your tracks by a loud, reverberating call, with a cadence that seems lifted from an old cartoon soundtrack. You scan the cattails, but it seems this comical sound has an invisible source. Then, after a long moment, into an opening in the cattails walks what looks like a good-sized heron, but with a mottled brown back and bold brown stripes running the length of its very long neck. 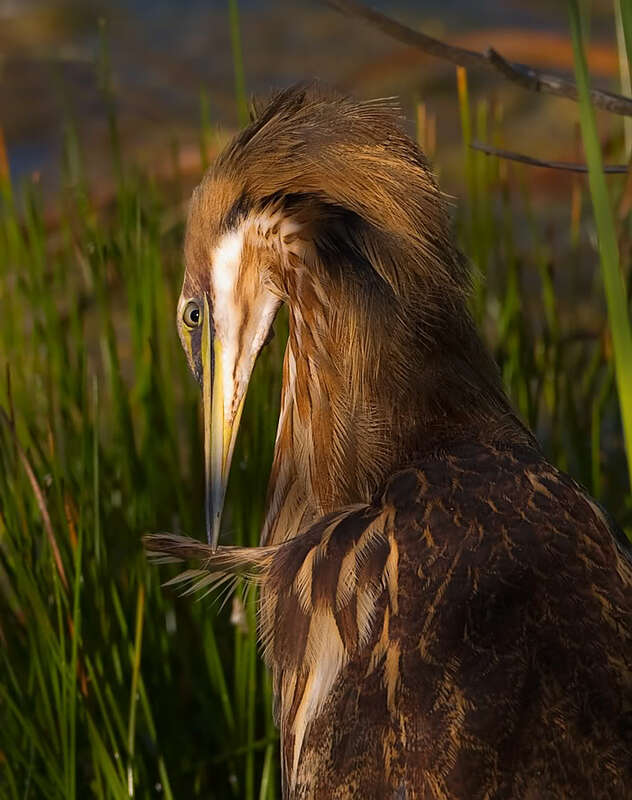 You are looking at an American Bittern, a member of the heron tribe that spends much of its time in the dense cover of the reeds. Bitterns are masters of camouflage. 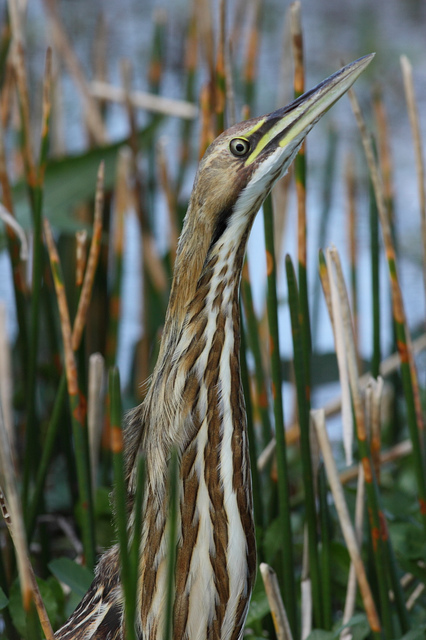 Not only does their striped plumage perfectly imitate surrounding vegetation, but for further concealment, they freeze, holding their heads and necks upward at an angle that mimics the reeds. Have you ever been awestruck by an unusual bird or its surprising behavior? Or experienced a magical moment when a bird did something that left you entranced? Let us know on Facebook, or drop us a line. Begin at our website, BirdNote.org. And thanks! I’m Mary McCann. Call of the American Bittern provided by The Macaulay Library of Natural Sounds at the Cornell Lab of Ornithology, Ithaca, New York. Recorded by S.R. Pantle.